Step 2 Add the remaining ingredients to the processor and blitz on high for approximately 2 minutes or until thoroughly combined and the mixture will stick together (scrape down sides 2-3 times during this process). Step 3 Roll tablespoon sized balls with the mixture then roll in (optional) coconut. Step 4 Refrigerate for ½ an hour before enjoying! (if you can wait this long). Notes: Swap dried pineapple for dried fruit of your choice. Swap cashews for nuts of your choice (I would recommend Macadamias, Almonds or Brazil Nuts). If you have no allergies and are feeling a little naughty you could always add a few white choc chips into the mixture right at the end! 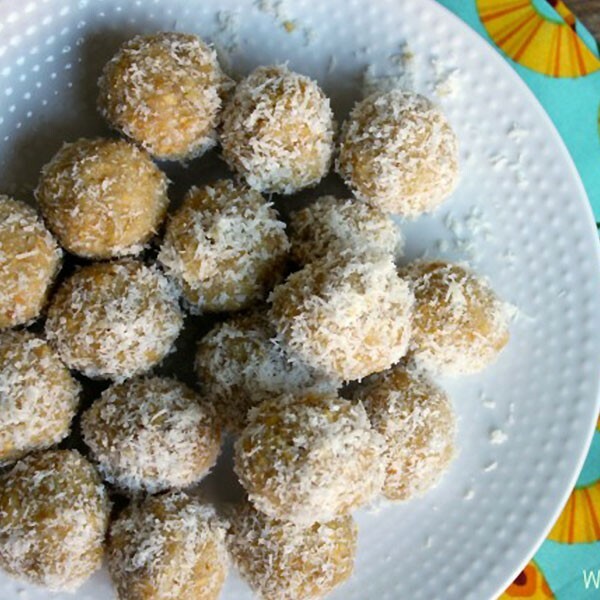 A delicious, fruity bliss ball that doesn't use dates.